Jimmy Burns� brand of blues has always been distinctive, mixing the downhome traditional blues sound of his native Mississippi with vintage Chicago soul (he recorded some classic 45s in the late �60s) and gospel music (which he performed as a teenager with the Medallionaires). Since his reemergence into the music on a fulltime basis in the �90s, Burns has established himself as one of the finest vocalist in the Windy City, and the blues genre itself. It Ain�t Right offers a hearty 15 tracks, consisting of mostly covers with the exception of the two opening tracks, the shuffle �Big Money Problem� and the terrific soul ballad �Will I Ever Find Somebody?,� both of which were penned by guitarist Billy Flynn. The covers include songs from Percy Mayfield (�Long As You�re Mine� and �My Heart Is Hangin� Heavy�), Goree Carter (�Rock Awhile�), the 5 Royales (�Crazy Crazy Crazy�), Jimmy Reed (�A String To Your Heart,� with Burns playing harmonica), and Burns� late brother Eddie (�Hard Hearted Woman�). I really like Burns� version of �Snaggletooth Mule,� a funky remake of the obscure Bobby Stone track, �Hoodoo Man,� and his upbeat take on �Stand By Me,� a bandstand favorite that his fans have wanted him to record for years. The jumping version of �Surrounded� is top notch as well, as is Larry Williams� �I Know You Hear Me Calling.� The horns (Marques Carroll � trumpet, Chris Neal � tenor sax, Aaron Getsug � baritone sax) feature prominently on both of these tracks. The title track is a rollicking version of the Little Walter classic. Burns sounds fantastic on these tunes, and the band is excellent in support. The horn section is great when called up, and Ariyo�s piano work is immaculate throughout. 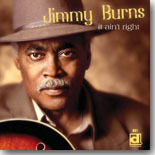 As stated above, It Ain�t Right is Jimmy Burns� best release, an irresistible mix of downhome and urban blues with soul and gospel that should be in every blues fan�s collection.